The Elder Scrolls Online 3000 Crown Pack cd key is a digital product or prepaid card code equivalent to 3000 crown for the game The Elder Scrolls Online. It granted a total of 3000 Crown (or game currency) to buy any object or item you want for your character. Once purchased this prepaid card of The Elder Scrolls Online 3000 Crown Pack, you will receive by email an activation key that you must introduce into your Bethesda account or in your Steam account from the library of games (there are two versions one for Bethesda and another for Steam), so we recommend carefully reading the information on how to activate this cd key in each of the stores. The Elder Scrolls Online is converted to a free model or Free2Play, which means no monthly fee and we can access all content for free. Still, it is possible to acquire payment cards of Crowns and time plus membership to increase the bonus that our characters will receive . 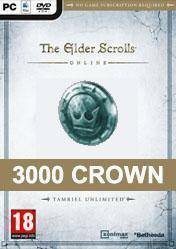 With these 3000 Crown we can buy all kinds of equipment for our heroes (potions, items, costumes, dyes and more) to help us create a unique character throughout Tamriel. The elder scroll online is a very nice game, it is very interesting to get that much crowns for such a cheap price ! Thanks for the deal, Imma buy it. ESO - Crowns On Sale Now!